The variety of tango looks we are getting is very interesting to me. There are lots of similarities but they don’t look all the same. There are a lot of distinctive looks. I find it very intriguing how that can happen. And some people have had more than one dress, even at the point in the season! I’m not sure which RD dress to like more on Madison Hubbell? The black lace (except I don’t know about beaded kind of tassels on it) or the red dress (but I’m not sure about the grey for accents)? I like them both. I think I’m leaning more to the red. But what happened to the very first dress, the velvety black from USIC? I liked that material. Now, looking back, however, it was not velvety and had one sleeve. I liked the bodice though and Zach’s black suspenders. Maybe that dress with full sleeves? The problem is they are all good! But which one is the best? I’m going with the black lace. I’ve decided I like the tassels after all, like a little leg curtain. And I think black is more “Maria de Buenos Aires”. Where I am not torn, however, is over her free program dress. I love it. It’s beautiful, aside from being a lovely blend of contemporary and time period. The back in particular is so lovely. And Zach’s costume is doing the same contemporary/time period really well. Nice touch. I also like Lorraine‘s RD dress. It is my favourite of her dresses by far (I think ever). I like the richness of the material. I’m still not on board with the blending colours, pink and grey, sort of ombre, for the free. Although, the program itself is winning me over a bit more, I’m still a hold out on the dress. Tiffany is another person who seems really into blending colours, with a side specialty in tie die. She did it last year and now again in the RD with sort of a wine and green mix. I’m on the fence. I would prefer two sleeves but I give her total points for the brooch. I do really like her black “Blues for Klook” look though. It’s simple and all that’s needed. I think it’s spot on. I guess Jonathan is into vests this year. Speaking of green RD dresses… I love Haley Sale‘s green dress. It’s gorgeous and gorgeous on her. I should mention her dress in the free too because it is also quite nice. I can’t say I have ever really noticed Haley’s outfits before. She’s really stepped it up. So let’s talk about the black skates. I’m sort of into them. 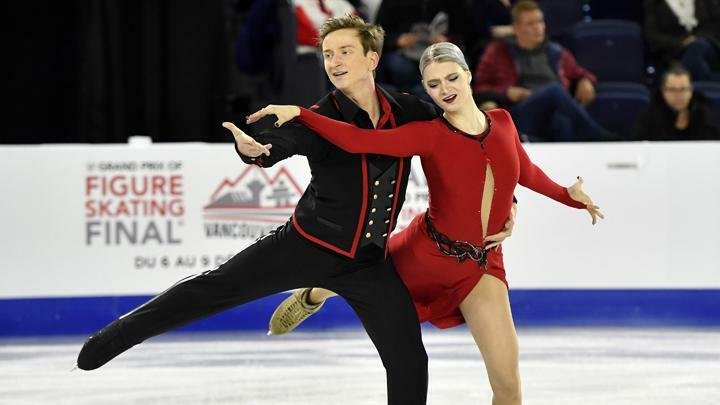 I think they are actually a good choice for Alexandra Nazarova especially since she is wearing black tights, appropriate to both outfits/programs, when she wears them. I quite like her RD dress too. I think it’s quite cool and unique. I do not like Alexandra’s free dance though. It’s just too sheer with no reason behind it, as far as I can tell. I think it undermines the program a bit – it’s just a distraction – and I’m pretty sure they weren’t wearing sheer dresses in Charlie Chaplin films anyway. I would keep the sheer short puff sleeves and nice collar and beading but the rest of the dress needs to be an opaque, not transparent material. (Ask Anna Cappellini about this. She would be able to advise.) I’m possibly a bit of a prude. 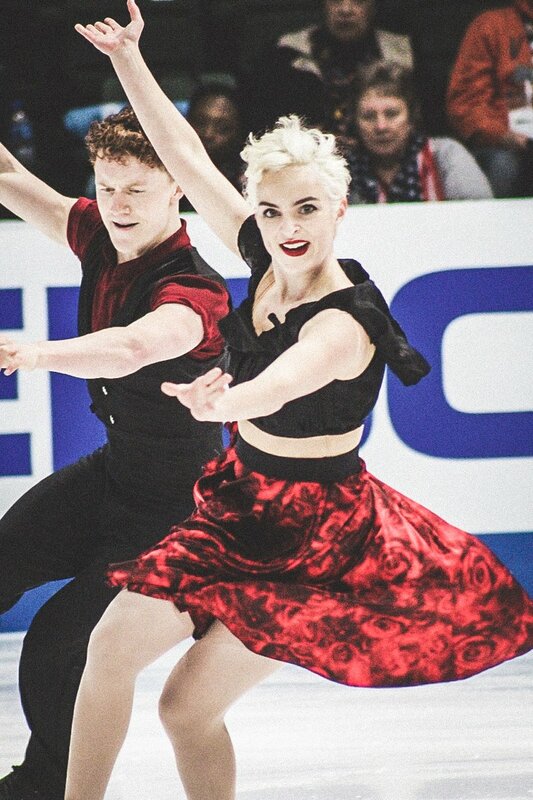 I found Natalia‘s free program dress a bit too much sheer as well. Although, I don’t have a time period argument against it. It does seem fine for the style. However, I will say that I don’t like the flesh-tones stripe on the arms. Just keep it black like everything else. And maybe put her in a unitard under that thing. However, knowing Natalia sometimes it takes her awhile to hit on the right look, so let’s give her some time. Katharina Muller needs to see my rule on black and blue for her tango dress. Although, I do pretty much like the dress. I like the lace over the hip. I think more of a bodice without the lace on top might be an improvement. I sort of like her free dress too from a distance but I don’t like image of cancer spreading out all over her. It’s perhaps too literal. Maybe my critique here would be to just stop overthinking everything. This is just ice dancing. And this is a confusing image. Karina Manta has two good looks, I think. They are both simple but effective in expressing the style. I think they are good costume work. The RD is probably my favourite of the two. I think Carolane looks great in their tango two-piece too. I think I’m in love. I’m not in love with her blue in the free though. I like to have some (more) flow! They really like Shane in a jacket, don’t they? Piper‘s yellow dress is beautiful. I’m not totally on board with her “Starry, Starry Night” dress. I think the colour and beading is lovely but I don’t quite like how stiff and texturized and big they’ve made some of the “painting” on the bodice. It probably looks good on the ice live but I still think there is another way to achieve the same effect without the… puffiness. And Paul has to get rid of that jacket in the the RD. It isn’t doing anyone any favours. I like Anastasia Skoptcova‘s long RD dress too. I like the belt and back detail, and the red is such a gorgeous deep, rich red. She also really carried off the whole look. I am wondering about her silver hair colour though… Maybe she’s between hair colours? Is that it? I also found her free dance dress look quite cool. The beading was maybe my favourite part. I don’t think Olivia‘s longer dress for the short works quite as well as some of the others. It does go quite a bit longer than most. I found it interesting that she changed her free look. It really was an entire look change (not just a dress) – man’s shirt and negligee to a sort of 1960s-reference dress. Although, I really like the change. I think this dress is pretty and fresh and she looks so naturally pretty and fresh too. (Is this the first time she has just worn her hair down without major styling? I think so.) I think it helps bring out the youth and romance of this program too. Or is this just me? I really enjoyed the program whatever was behind it but I think the new outfits deserve some credit. Victoria‘s RD dress is one where I question the structural sense of it, so I can’t be completely on board. I like it from the front but I found myself sometimes struggling with the back and side view. Something about it just makes me expect the whole thing fly off her shoulders and fall down. I end up focusing on it way too much (clearly). See, it’s confusing, right? I do like her new free dance dress in a mild way. I’m pretty sure it’s new, right? Yes, it is. She’s gone from white to creamy-taupe (?) and sheer, and a bit more decorative. I like it more. Hmm… I have some issues with Marie-Jade‘s RD dress too. I think it seems too cut up. I’d rather just have full sleeves and a cool back. The one sleeve-half sleeve thing isn’t working for me… nor is Romain’s suit. But hello! Then they come out in the free and I love everything. (I just wish the camera person got a better angle on the sliding feature.) I love that she gets away with the catsuit by adding the little ballet practice skirt. I have decided, however, that I like Wang Shiyue‘s tango dress. I think it would be better with the skirt as a solid colour (maybe maroon? ), but I’ve decided that if it has to be a pattern at least it’s a pretty one. (He’s looking quite good with his ruffle and vest. And he really is SO tall. He was towering over Patrice.) She’s quite shimmery too. I don’t really care that much about what they are wearing in the free. It hasn’t captured me anyway. I’m not into Robynne Tweedale‘s pink and grey number in the free either (her or Lorraine – I’m sorry, it’s just not the best colour cominbation). I think the belt on it is weird too. But I have really enjoyed her red tango Lola number both times, and her rose, and her facial expression. And wow, her lipstick too! I’m also into Lilah‘s red dress, but I think maybe my favourite dress of all is her shiny blue disco number. It’s just all-round terrific. It looks great on her and it’s fun and entirely embodies the dance style. Keeping dancing, my friends, keep dancing! Love, love, love. We get to see them again at NHK! I think I’m going to start a list of skaters who are going two for two this season. That is two good outfits that I like out of two. I wonder who is going to make the list? It’s just anyone who is going to be able to do it.